Korea is well on its way to becoming a major player in the global robotics market. Compared with the more visible and louder robotics industries of its Asian neighbors, Korea, fancifully named The Land of the Morning Calm by British travel writers of the 1880s, has, until very recently, kept a modestly calm profile to its otherwise brisk R&D pace in robotics. Although as Yoo Tae Jun, vice chairman of the Korea Association of Robot Industry, tells us, Korea has a 35-year history of designing and building robots, yet not until 2003 was robotics earmarked as “a new engine of growth” by the country. 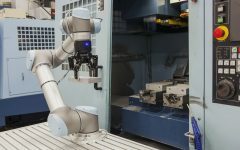 With the vast majority of our Asian robotics coverage taken up with Australia, China, Japan and the countries of the ASEAN region, we wanted to get up close with Korea to find out what?s hot and not with the quiet giant. Known to Koreans as a culture of hurry-hurry–that focuses on getting things done as quickly as possible, we wanted to pull back the curtain a bit and chronicle the hurry-hurry behind Korea?s rapid annual growth of 21 percent. John Edwards, fresh from his Canada, Australia and United Kingdom robotics updates, was more than curious, so off he went. Here’s what got his attention. You know that a nation takes robotics very seriously when it goes so far as to develop a massive combination theme park and research center dedicated to the technology. That’s exactly what’s happening in South Korea, a nation that expects to soon host the world?s first theme park devoted to robotics and artificial intelligence. Scheduled to open in 2016, Robot Land will include a family-friendly amusement park with rides and attractions, a water park and a luxury hotel. Roller coasters and water slides aside, Robot Land will also be home to a graduate school for robotics, a state-of-the-art research and development lab, and a residential complex and retail center. Spanning 387,505 square meters (4.2 million square feet) in coastal Incheon, 30 km (19 miles) from Seoul and 15 minutes from the Incheon airport, Robot Land is being funded with investments from national and local governments, as well as private developers. Upon completion, the project is estimated to cost approximately $625 million. Korea’s fascination with all things robotic is nothing new. The country has a 35-year history of designing and building robots, says Yoo Tae Jun, vice chairman of the Korea Association of Robot Industry (KAR). The nation, which is already a big-time player in electronics, chemicals, shipbuilding, steel production, and many other major industries, is now working to position itself as a leading producer of robots and related technologies. “The government selected the robotics industry as a new growth engine in 2003 and put in place diverse policy support,” Jun says. He notes that Korean robotics has grown rapidly over the past decade. “The statistics show that since 2008, the Korean robot industry has marked an average annual growth rate of 21 percent,” he says. Since 2008 a series of government actions and initiatives, such as the Intelligent Robot Development and Promotion Act, have helped propel the Korean robotics industry forward. In 2010 the government’s Ministry of Trade, Industry, and Energy established a robotics division to oversee industry development. The ministry also established a quasi-government robot industry promotion organization, the Korea Institute for Robot Industry Advancement (KIRIA). “KIRIA has so far promoted the Korean robot industry by numerous measures, such as robot policy formulation, robot information dissemination, standardization activities, and infrastructures, such as robot test facilities,” Jun says. “Especially [promoted] are robot pilot projects, with annual budget of about $20 million since 2011.” KIRIA is also responsible for constructing a national robot research and development center. Jun says that a growing Korean robotics industry directly benefits the entire national economy. “Robot sales have not only driven export increases, but also employment,” he says. Over three years, from 2009 to 2012, robot sales increased from $940 million to $2 billion, Jun says. Over the same period, exports grew from $96 million to $590 million, while employment climbed from 5,068 to 10,515 workers. In 2008, Jun notes, the Korean government established a five-year $1 billion program “to build up 100,000 young leaders … focusing on building up masters and doctors degree students of robot and mechatronics.” He adds that the government also financially assists nine university-based robotics R&D centers. A key robotics education facility is the Intelligent Robotics Laboratory (IRL), established in 1993 by Korea University’s Department of Mechanical Engineering. IRL operates one of the leading robotics R&D labs in Korea. IRL is focusing its current research efforts on various technologies, including the design and control of intelligent robotic systems, safe manipulators, variable stiffness actuators, and indoor and outdoor mobile robot navigation systems. The lab has published more than 450 papers in various journals and for numerous conferences. At last count, IRL holds 10 patents and has applied for two more. Chonnam National University is another important education and research facility. Among the many projects Chonnam researchers are currently pursuing is a robotic technology designed to serve as a new cancer treatment. The approach, which promises to be more efficient and less harmful than chemotherapy, uses nanorobots that can detect and treat cancer cells in a way that avoids the harmful side effects of modern cancer-fighting drugs. To create the treatment, Chonnam researchers developed genetically modified salmonella bacteria that are drawn to tumors by chemicals secreted by cancer cells. The bacteria carry microscopic robots, about 3 micrometers in size, that automatically release capsules filled with drugs when the bacteria reach the tumor. By delivering drugs directly to the tumor, each nanorobot, dubbed Bacteriobot, attacks the tumor while leaving healthy cells alone. The process spares patient from the often traumatic side effects of chemotherapy. While Bacteriobot can only detect tumor-forming cancers, such as breast cancer and colorectal cancer, the researchers hope that the technology will eventually be able to treat other cancers as well. Although the system has shown that it can work effectively in mice, the team is confident it will also work in people. Bacteriobot has already been patented in the U.S., Japan, and Europe. For the past decade or so, researchers at the Center for Intelligent Robotics at the Korean Institute of Science and Technology (KIST) have been developing and refining a household service robot. Their robot maid, named CIROS, is designed to help out around the home by performing an array of basic chores. The current CIROS version boasts an impressive list of capabilities, including food preparation and dishwasher loading. CIROS measures 160 centimeters (5.3 feet) tall, and weighs 150 kilograms (330 pounds). The system is designed to move in any direction on its wheeled base. CIROS ?also boasts a built-in speech recognition capability, made possible via a 12-microphone array. The system can also detect and avoid obstacles in its vicinity using a pair of laser rangefinders and six ultrasonic sensors mounted in its body. The robot’s hands can hold a variety of objects and tools, making it capable of pouring drinks, carrying trays, and slicing vegetables. According to KIST researchers, CIROS is able to recognize common objects as well as kitchen appliances like microwaves, sinks, refrigerators, and washing machines, and can move intelligently through its environment. The robot’s artificial intelligence is the result of collaboration between robotics labs at several Korean institutions including Seoul National University, the Korean Advanced Institute of Science and Technology (KAIST), Korea University, Sungkyukwan University, Sogang University, and the Pohang University of Science and Technology (POSTECH). Korea’s rich maritime heritage is reflected in numerous aquatic robot projects. The Korean Institute of Ocean Science and Technology, for instance, has developed a crab-like robot?the largest underwater robot ever developed. The system known as Crabster or CR200, weighs over half a ton (.45 metric ton) and features a set of six walking legs. The Crabster measures 2.4 meters (7.9 feet) long, 2.4 meters (7.9 feet) wide and, with its half-dozen legs fully extended, 1.8 meters (5.9 feet) high. The robot crawls along at a relatively leisurely pace, since it was designed to move no faster than 10cm (4 inches) per second. Project researchers are now working to boost Crabsters’ speed, but strong currents make it difficult to create an underwater robot that’s both fast and stable. Another maritime robot project, currently underway at the Urban Robotics Lab of the Korea Advanced Institute of Science and Technology, aims to lower the threat created by dangerous and destructive coastal jellyfish. A trio of undersea robots, named the Jellyfish Elimination Robotic Swarm, will work to reduce deadly attacks on humans, fisheries, and even nuclear power plants. Equipped with GPS technology and cameras to detect jellyfish swarms, the robots travel together on the surface via propulsion motors, scooping up jellyfish in submerged nets. A shredding propeller then turns the creatures into something like… jelly. The researchers hope that the robots can eventually make a substantial dent in the Korean jellyfish population. Jun is confident that Korea is well on its way to becoming a major player in the global robotics market. He notes that in Korea the word “threat” can mean either “crisis” or “opportunity.” “The world economy has been in recession for almost 10 years, and there is still a long way for us to go to catch up and compete with robot-advanced countries such as Germany, the U.S, and Japan,” he says. A veteran technology journalist, John Edwards has written for a wide range of publications, including The New York Times, Washington Post, CFO Magazine, CIO Magazine, InformationWeek, Defense Systems, Defense News/C4ISR&N, IEEE Signal Processing Magazine, IEEE Computer, The Economist Intelligence Unit, Law Technology News, Network World, Computerworld, and Robotics Business Review. He is also the author of several books on business-technology topics. A New York native, John now lives and works in Gilbert, Ariz.